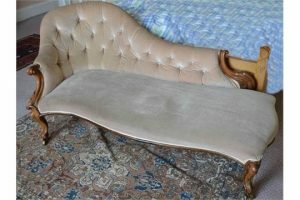 A Victorian rosewood chaise lounge, the velvet upholstered back and seat raised on foliate and scroll carved cabriole legs and brass casters. 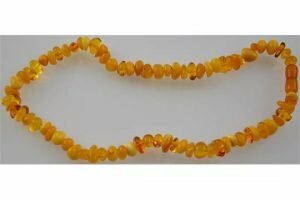 A genuine natural butterscotch and Baltic amber necklace. 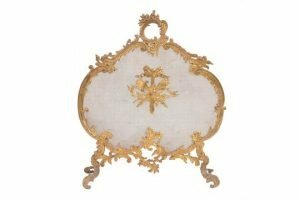 A Victorian brass and mesh fire screen in Rococo revival taste, circa 1880, of cartouche form with foliate cast outer edge and handle, on four foliate cast feet. 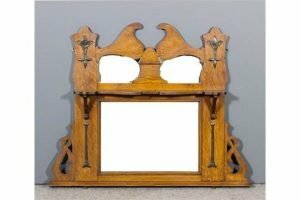 An early 20th Century oak oval mantel mirror in the Arts & Crafts style, with scroll cresting and oxidised metal mounts, inset with plain and bevelled mirror panels, fretted brackets to sides. 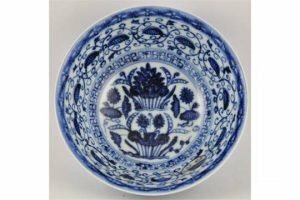 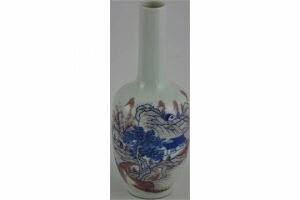 A Chinese blue, white and copper red long neck vase, decorated with a pastoral scene, bears a six character kangxi style mark to base. 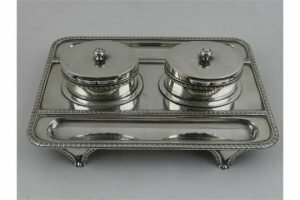 A Victorian silver double ink stand, decorated with gadrooned edges and glass lined ink wells, hallmarked George Lambert, London 1891. 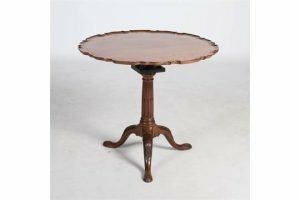 A George III style mahogany snap top bird cage occasional table, the hinged circular top with a scalloped edge, resting on a bird cage and fluted column with three foliate carved downswept supports. 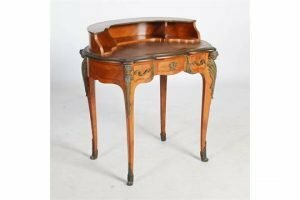 A French kingwood and gilt metal mounted crescent shaped writing desk, the shaped top with skiver insert and three pigeon holes above three frieze drawers, raised on slender cabriole supports with figural and foliate cast mounts. 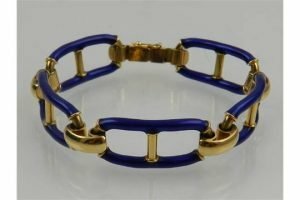 An 18 carat yellow gold and cobalt blue enamelled segment articulated bracelet. 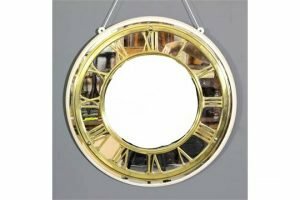 A heavy brass circular clock chapter ring, with Roman numerals, 18ins diameter, mounted on circular mirror panel and painted panel. 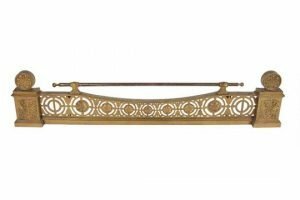 An Empire gilt bronze and iron mounted adjustable fender, early 19th century, with horizontal rail held on two supports above an openwork front of pierced circlets, centred by foliate cast mounts, the rectangular plinths at each end with cylindrical finials with further foliate cast mounts. 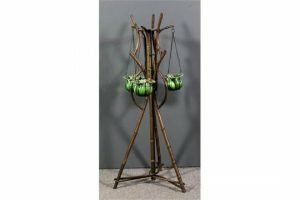 A late Victorian bamboo jardiniere stand with central support and three splayed supports, hung with three green glazed pottery fern pots. 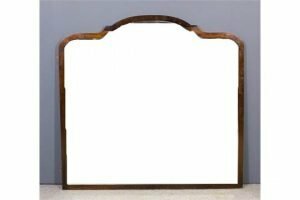 A 20th Century South African stinkwood framed rectangular wall mirror with arched top, by Reid’s of Maritzburg, inset with bevelled mirror plate. 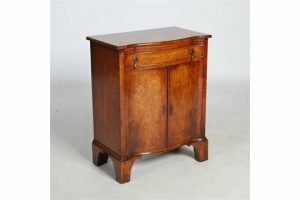 A reproduction walnut serpentine side cabinet, the shaped top above a brush slide and frieze drawer, over a pair of cupboard doors opening to a fitted interior, raised on bracket feet. 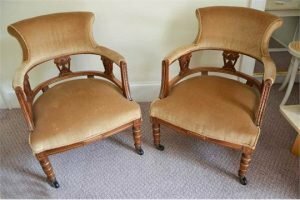 A pair of Victorian walnut tub chairs, the velvet upholstered backs, arms and seats raised on turned supports with gilded details. 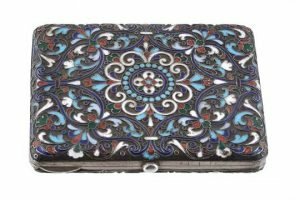 A Russian silver and enamel rectangular cigarette case by Ivan Zakarov, Kokoshnik mark for 1896-1908, 84 zolotniks, converted to a powder compact, cloisonné enamelled in a formal scroll design, the interior with a mirror and powder fitments. 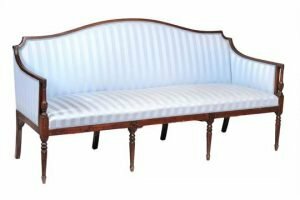 A mahogany three-seat sofa in Regency style , 20th century, the arched back and arms with baluster supports above the over-stuffed seat and fluted tapering front legs, with pale blue upholstery.